After my trip down to the Gulf Coast in February, I came home with a ton of Meyer Lemons from my aunt’s own tree. I’ve been steadily trying to use them up in muffins or any other lemon recipe I could find, but in the end I wound up making lemon curd. I hope everyone reading this has made lemon curd before and if not, get yourself some lemons so you can make it soon! The process is quick and simple and you’ll want to spoon some of that sweet-tart lemony goodness on everything from your morning toast, to your ice cream for dessert. Since I had so many lemons to use up, my batch turned out to be almost 3 cups of curd, which unfortunately wasn’t going to keep forever. I’m more than happy to eat it by the spoonful but I knew I had to find a way to use it up faster. 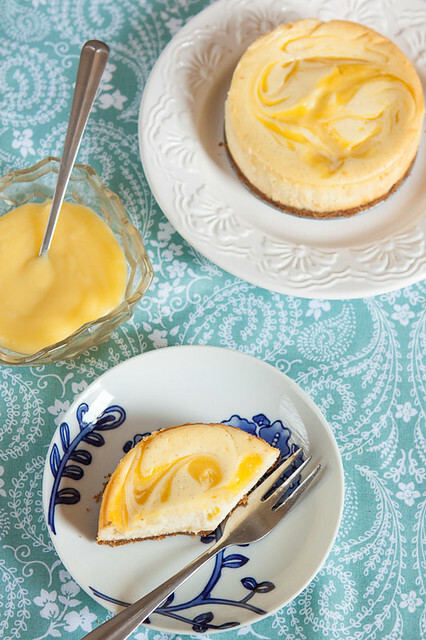 As I was swirling lemon curd into my yogurt, I realized it would be the perfect addition to my favorite cheesecake. Since vanilla and citrus go so well together, I wanted to really pump up the vanilla flavor in the cheesecake by using vanilla beans instead of extract. I have to confess I’ve never used vanilla beans before and I’m really regretting it after tasting this cheesecake. I’ll be using them a lot more from now on, but I won’t be making the mistake of buying them from the grocery store again. Two vanilla beans at the store wound up costing slightly less than 1/4 pound of beans (almost 30!) online. How do grocery stores get away with that?? I love using my mini springform pans since they make it easy to experiment without the fear of ruining a whole cheesecake. I had a bunch of Cara Cara and Blood Oranges and since the lemon curd turned out so well I decided to try orange curd, too. The orange curd’s texture isn’t quite as smooth as the lemon curd (I’m still not sure why), but it tastes great. It’s just like that orange slice candy! And thankfully, once the orange curd is swirled into the cheesecake and baked, the texture smooths out and tastes even better. 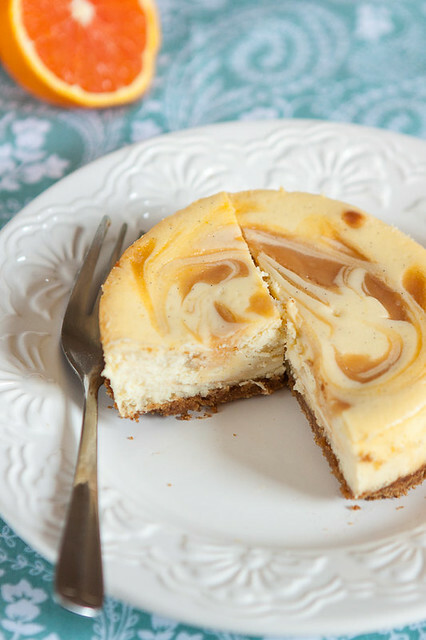 If you love Orange Dreamsicles, you will love how this cheesecake tastes! 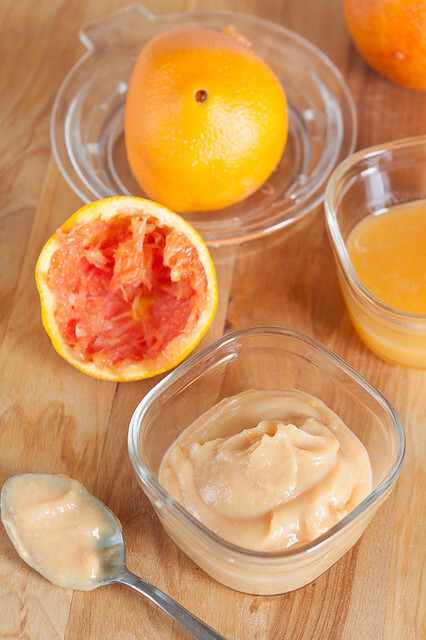 This recipe can easily be modified with pretty much any other citrus fruit of your choice, like lime, grapefruit or pineapple. Or you can skip the curd all together and just make a simple vanilla bean cheesecake if you prefer. I’ve been using this cheesecake recipe for 5 years and it hasn’t let me down yet. Just make sure you have some extra patience so you can wait the full 24 hours to dig into it! If using a normal lemon or other tart citrus, increase the sugar to 3/4 cup. 2 cups of crumbs is fine if you only want crust on the bottom. Use 3 cups if you want sides. If you love vanilla bean or if your beans are thin, feel free to add another bean for more flavor. Place a mesh strainer over a bowl and set aside. In a saucepan whisk together sugar, juice, eggs and zest. Set the pan over low heat, add in butter and continue whisking until melted. Increase heat slightly to medium-low, continue cooking, whisking constantly, until the curd thickens and starts to look like jelly. It should be 160 degrees F. This will take about 10 to 15 minutes. Remove from heat and immediately pour through the strainer. Cover and store in the fridge until chilled. This can also be made ahead of time since the curd will keep in the fridge for up to 1 week. Grind up crackers in a blender or food processor if necessary. Mix crumbs, sugar, salt and butter in a bowl until combined and press into the bottom and if you want, about an inch or two up the sides of a 10″ springform pan. Bake for 10 minutes. Take out and cool completely. Turn off the oven. Add in the sugar, flour and heavy cream and and mix on low speed until fully incorporated, about 1-2 minutes. Do not over-mix as this will create more air bubbles which can contribute to your cake cracking. Pour half of the batter into the prepared pan. 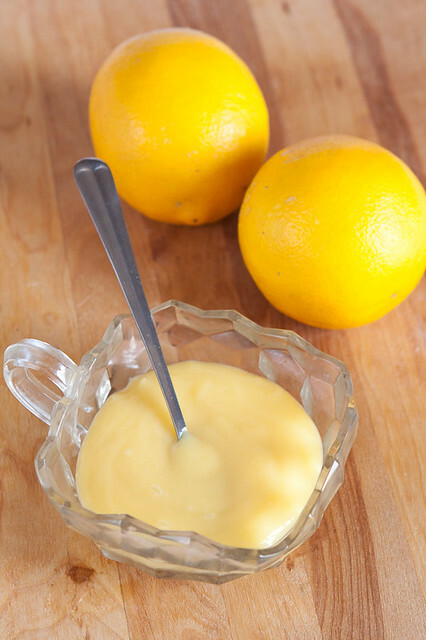 Drop spoonfuls of the citrus curd on top and gently swirl with the tip of a knife. Repeat with remaining batter and curd. You won’t necessarily use all the curd, add as much or little as you want! Gently tap the pan against your counter a few times to help get any possible air bubbles out of the batter. Place cheesecake in your oven and then turn it on to 400 degrees (F). Full size: Bake for 15 minutes. Turn the oven down to 200 degrees (F). Bake for 3 hours. Then turn the oven off, prop open the door slightly and let cool for 1 hour. Finally, cover the top with plastic wrap, place in your refrigerator and chill for a full 24 hours. Small size: Bake for 10 minutes. Turn the oven down to 200 degrees (F). Bake for 1 hour. Then turn the oven off, prop open the door slightly and let cool for 30 minutes. Finally, cover the top with plastic wrap, place in your refrigerator and chill at least 12 hours. If you have leftover cheesecake batter or you want to make even smaller cheesecakes, you can also make this recipe in cupcake tins with foil cupcake liners. Bake for 10 minutes at 400 degrees (F). Turn the oven down to 200 degrees (F) and bake for 30 minutes. Immediately remove from oven to cool instead of leaving them in there for an hour. You don’t need to bake the crust for cupcake-sized cheesecakes. If you want to half the recipe, use 3 blocks of cream cheese and 3 whole eggs instead of a combo of eggs and egg yolks. I need to get my hands on some mini springform pans! 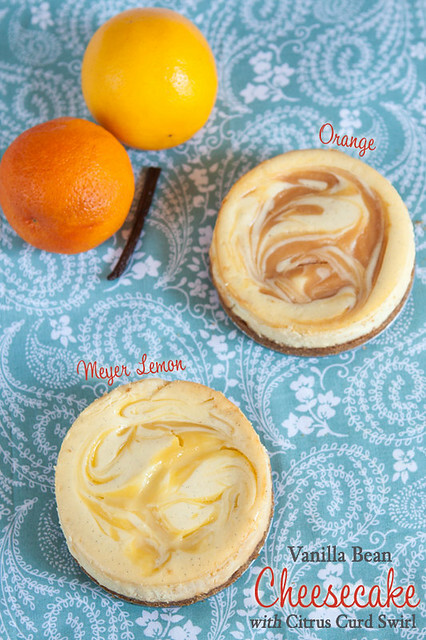 Love the sound of these cheesecakes! I agree with Jessica, I want some mini springform pans, too! 😉 Besides the cuteness of these cheesecakes, they sound delicious. I’m a big lemon curd fan, too. In fact, the first time I made it I had no idea you were supposed to put it ON things. I just ate it like a pudding. I know, I’m so sophisticated. I love the idea of it in a cheesecake and made with orange, too. Citrus win. Just wrote dwn this fenomenal recipe. For my hubby, to make me one, tomorrow night, for my Bday party this Saturday. 3/23. Thanks fir it and congrats. Your recipe just made me hungry for cheesecake. I’m gonna make me some of these as soon as I get some mayer lemons. Thanks for sharing this recipe. We made a bazillion cheesecakes at school last week. None were as cute as these! oh my! 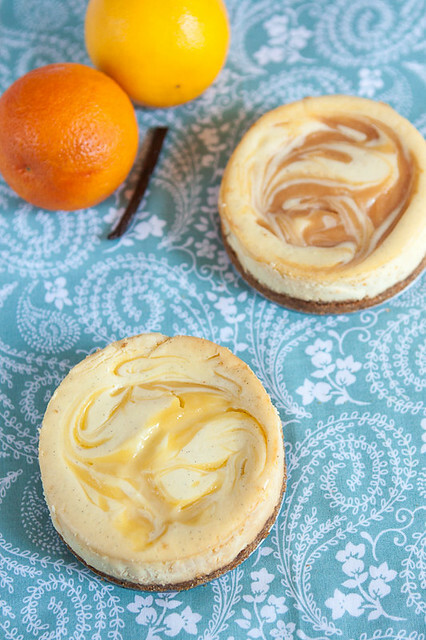 i need to get me some mini cheesecake pans and make these!